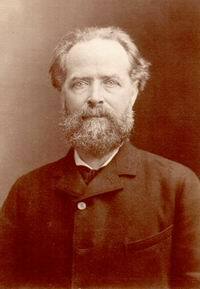 Birth of Élisée Reclus (1830-1905), French geographer, and anarchist, author of the 19-volume work La Nouvelle Géographie universelle, la terre et les hommes. 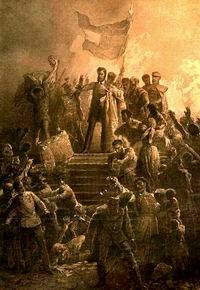 Start of the Hungarian Revolution of 1848. Demonstrators march through the city of Pest to the buildings of the Imperial Governing Council. They have a list of demands (the “12 Points”), including freedom of the press, abolition of censorship, a government responsible to the people, civil and religious equality before the law, a national guard in place of a standing army, the freeing of political prisoners, and abolition of the feudal land tenure system. In the face of the massed demonstrators, the Imperial governor agrees to accept all their demands, and a new reformist government is put in place. 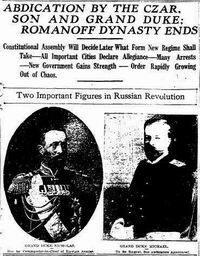 Czar Nicholas II abdicates in Russia, swept away by the revolution that erupted a week earlier. A provisional government is formed. 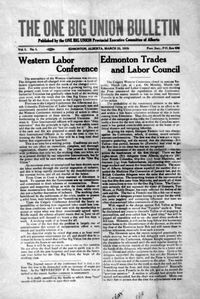 Delegates from unions across western Canada meet in Calgary and vote to hold a referendum among union members on a proposal to form a revolutionary socialist union to be called the One Big Union. The referendum passes with overwhelming support, and in June the One Big Union is officially formed. By 1920 the OBU has 50,000 members from northern Ontario to the west coast. 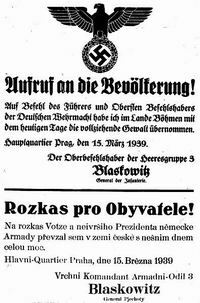 German troops invade and occupy Czechoslavakia.